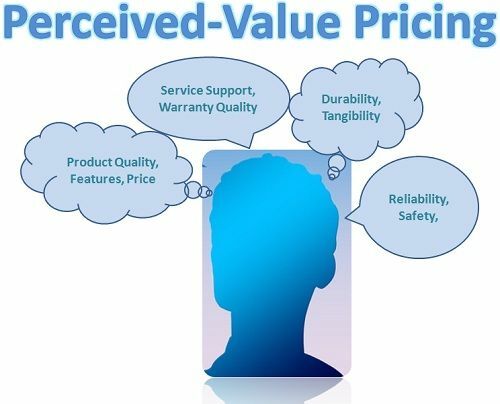 Definition: In Perceived-Value Pricing method, a firm sets the price of a product by considering what product image a customer carries in his mind and how much he is willing to pay for it. In other words, pricing a product on the basis of what the customer is ready to pay for it, is called as a Perceived-value pricing. The perceived value is made up of several elements such as buyer’s experience with the product, service support, warranty quality, channel deliverables, customer support, supplier’s reputation, trustworthiness, etc. Every company tries to enhance the perceived value in customer’s minds by adopting several marketing mix elements such as advertising, promotion, sales force, etc. Many times, the customer is not aware of the cost incurred by the firm in producing the product, but what they only care is the final price and how much it varies from the competitor’s product. The company must inform the customers the additional value that their product is offering and for which extra amount is being charged. Such as durability, features, reliability, service, warranty, etc. differentiates one product from the other and the customer is willing to pay extra for these additional benefits. This method suffers from several limitations; sometimes a customer may suspect that the company has exaggerated about its product quality and services. Also, there is a segment of buyers who are price conscious and do not want to pay extra for a product. The benefit of using this method is only when a company offers more value that its competitor.